I am a still-image photographer and architect, and I mainly use Canon EOS 5D Mark II for photography or even sometimes analytic purposes. Canon EOS 5D Mark II is the great DSLR camera that shoots 1080p videos in .mov format. However, I tried to import the videos to Final Cut Pro, I got error message. When looking for a right tool for my DSLR movies, I found three packages that would convert the .move files. Then I downloaded all three, tested the speed and interface, and ended up with Aunsoft Video Converter for Mac. I took it not only because the speed, but also the codec/format to best maintain the quality of my videos, i.e. it is possible to convert videos to ProRes similar format for lossless editing with FCP, keeping 1080p HD resolution. If you have other digital SLR cameras with video shooting function like Canon EOS 7D, EOS-1D Mark IV, EOS 60D, Sony Alpha NEX-VG10, NEX-5, you can also use Aunsoft Video Converter for Mac as the best DSLR camera video converter on Mac. Below is the fast guide for you to convert Videos to Lossless codec like ProRes for Editing in Final Cut Pro. Step 1. Download DSLR videos to Aunsoft Video Converter for Mac. Run Aunsoft Video Converter for Mac as the best Mac Canon DSLR video to FCP ProRes converter. Click the "Add" button to import .mov files from the camera. Step 2. Choose ProRes format with 1080p HD. Click the "Format" option, and navigate to Final Cut Pro > Apple ProRes 422 (HQ) (*.mov) as output format. Then click the "Settings" button and choose 1920*1080 as output video size. In terms of output profile options under Final Cut Pro group, Apple ProRes 4444 supports 12-bit pixel depth with an optional, mathematically lossless alpha channel for true 4:4:4:4 support. But Apple ProRes 444 requires high computer configuration. Apple ProRes 422 (HQ) would also offer visually lossless preservation of the HD videos. Thus, we here choose Apple ProRes 422 (HQ) codec for nearly lossless editing. Step 3. 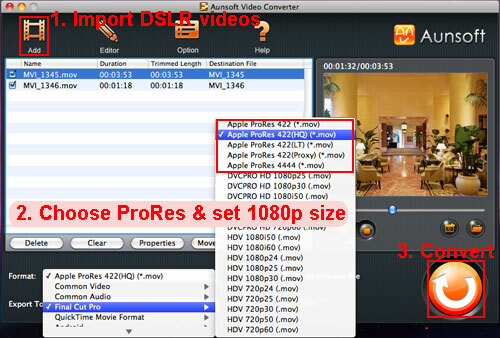 Convert DSLR video to ProRes 422 HQ MOV for FCP. Click the convert button under the preview window, the Mac Canon 5D Mark II video converter will start converting DSLR video to ProRes 422 HQ .mov in 1920x1080 for editing in Final Cut Pro 7, Final Cut Studio. After the conversion, you can edit ProRes 422 HQ movies in Final Cut Pro like other uncompressed video or lossless codec. Aunsoft Studio provides discount for every Tuesday, just visit www.aunsoft.com to get the discounted product.